Jim Cauble with daughter Chris Roof and Lewis Cauble at the 2018 Pullen Society induction ceremony. Photo by Becky Kirkland. Oftentimes, it’s the parent who leads a charge and their offspring follow. When it came to supporting NC State through a planned gift, the Caubles – among several examples of multigenerational planned-giving philanthropy at the university – did things in reverse. When Lewis decided to create a bequest to benefit NC State’s Apiculture Science Fund, housed within the College of Agriculture and Life Sciences, one of the first people he told was his dad. Jim then set out to establish a scholarship. The Jim and Joan Cauble Scholarship is a need-based scholarship to be awarded to an undergraduate in the College of Engineering. It’s also meant to honor his late wife, Joan. The two got married just two weeks after Jim graduated from NC State in 1953 with a degree in mechanical engineering. The two have distinctly different ties to NC State, and each has given to the university over the years. As a graduate, Jim said he has always felt that attachment to the university that alumni often do, keeping up with sports and with several classmates over the years. An advocate for providing education to those who might not otherwise be able to afford it, Jim thought a scholarship was an important way to lend his support. “My feeling is, education is the number-one key to improving people’s station in life,” Jim said. Lewis didn’t graduate from NC State but was drawn to supporting the university by the research of Dr. David Tarpy, an apiculture specialist and a professor and extension specialist in the Department of Entomology and Plant Pathology. Lewis enjoyed a career as a field scientist for the Research Triangle Institute before deciding to take some time off to find his real passion in life. A stint as a carpenter led to an introduction to honeybees, which quickly became his life’s work. Today, he is one of six apiary inspectors for the NC Department of Agriculture and Consumer Services, serving beekeepers in the 21 counties of North Carolina’s Western Region. Lewis was introduced to Tarpy through the North Carolina State Beekeepers Association (NCSBA). He knew that Tarpy’s work researching the science of beekeeping was vital, and something he wanted to support. He designated NC State Apiculture Science as the beneficiary of one of his 401k retirement accounts. Jim’s wishes upon his passing will expand the tradition of family giving. His will establishes a charitable remainder unitrust, a portion of which goes to the Jim and Joan Cauble Scholarship while his two children – son Lewis and daughter, Chris Roof – had the option to select a recipient of the remaining portion of that fund. Lewis asked that his portion be directed to the Apiculture Science Fund, while Chris’ portion is earmarked for the VetMed Companion Pet Assistance Fund. 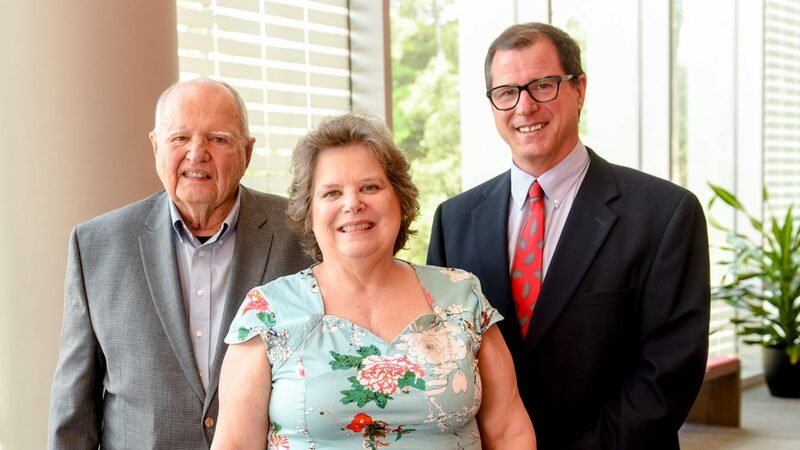 Continuing to lead by example one more time, Lewis was inducted in 2017 into the R. Stanhope Pullen Society, which recognizes those who follow in the footsteps of NC State’s first planned giving donor – R. Stanhope Pullen – by making a deferred gift through their estate. Jim got inducted this past spring and his son was there for the ceremony. “Being inducted in 2017, and then watching Dad follow in 2018 was very special to me,” Lewis said.